Interior Features Spacious Two Story Home. 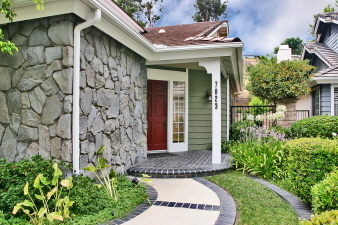 Beautifully Located, Updated, and Well Maintained. Large Master Suite with Retreat. Kingsized Master Bath with custom Walk-In Closet, Private Water Closet, Soaking Tub and Large Stall Shower. Updated Kitchen, Breakfast Area. Custom Fireplace in Family Room with Wet Bar. Formal Living Room and Dining Room. Inside Laundry Room with Storage and Walk-In Storage Closet. 3 Car Garage with direct home access. Exterior Features Over $30,000 recently spent on the Resort Style Yard. The Yard is the Perfect extension to the already GREAT House! Lovely Landscaping. Private and Gated. Near New top of the line BBQ cooking center. Patios. Green Areas and loads of Flowering Trees and Shrubs.